In fact, I have several Amazon-related income streams myself! It’s the 4th most popular website in the country, and 10th most popular in the entire world. That means there’s a huge volume of traffic–and buyers–visiting every day. Let’s dive in and explore some of the many ways to make money on Amazon. Retail arbitrage is a classic “buy low, sell high” business model. How it works is you find products at deep discounts locally, and resell them on Amazon for a profit. If you want, Amazon will even handle the shipping for you through their FBA, or Fulfillment by Amazon, program. An Amazon Seller Account — Jessica recommended the free Personal seller account for people just getting started. Once you’re selling more than 40 items a month, it makes sense to upgrade to the Professional account level. The Amazon Seller app — Available on iOS and Android for free. A few dollars to buy your initial inventory. The next time you’re out shopping, stop by the clearance section and get scanning. The app will tell you what the item is going for on Amazon, and what you’d earn after fees for selling it. Then you can look at the price tag in front of you and see if that’s a worthwhile purchase. The other thing you’ll want to pay attention to is the item’s “sales rank.” This is an indicator of how popular the item is, or how fast it’ll sell. The lower the number the better, but generally speaking, a sales rank under 100,000 will typically sell pretty quickly. I tested this side hustle myself and earned a little over $650 in my spare time. Jessica Larrew and her husband Cliff have been reselling on Amazon for years. And though it started as a part-time side hustle, it turned into a serious business–they’ve sold more than $1 million worth of stuff on Amazon! I sat down with Jessica to learn her favorite places to shop, the product categories she likes, what she looks for, and how the whole process works. You can listen to our full interview on reselling on Amazon, or download The Side Hustle Show on your favorite podcast app. Jessica also has a free 7-day email course to dive deeper into this business model and see if it’s right for you. Online arbitrage works similarly to retail arbitrage above, except instead of sourcing your inventory from local stores, you buy it online. Now why would one website sell a product for a dramatically lower price than Amazon? It’s hard to say, but it happens. If you have a keen eye for deals, especially if you can stack up cash back from sites like Ebates and credit card rewards, you can source profitable inventory. According to Jessica Larrew (see above), your return on investment is often lower for online arbitrage purchases, but you can usually find more of a profitable item than you could in your local store. Now you probably have better things to do than scour the ends of the Internet comparing prices on random products. But if you’re thinking, that’s probably a job a robot could do, you’d be right. There are a couple software tools to help find these deals, and both offer free trials to test them out. Jessica said her current favorite was Source Mogul, while another Amazon seller, Amit Desai, recommended Tactical Arbitrage. Tactical Arbitrage seems to have a few more advanced features, but Jessica preferred Source Mogul’s clean and easy-to-use interface. When we spoke, Amit was on track for $250,000 in Amazon FBA sales last year, all on the side from his day job. He said he aims for a 20-30% profit margin. You can check out our full Amazon arbitrage conversation here, or download The Side Hustle Show on your favorite podcast app. Another popular side hustle on Amazon is reselling used books. This is an easy one to get started with. You can use an app like Bookscouter to scan the ISBN barcodes on books to see what they’re selling for on Amazon. Like retail arbitrage, it can be a bit of a needle-in-the-haystack search. Because if we’re being honest, most used books are practically worthless. Every other house in the country has a stack of Harry Potters lying around too; they’re not exactly hard to come by on the supply-and-demand curve. But certain books command a premium, even as used copies. Those are usually textbooks, out-of-print guides, or other rare editions. Check local garage sales, thrift stores, or your library bookstore to see if anything turns up. The cool thing here is that your cost of acquiring inventory will likely be super low; books are often priced at $1 or less at garage sales. Within the Amazon gold rush of the last several years, private labeling has gotten a lot of attention. This practice allows individual entrepreneurs, like you and me, to essentially create our own branded products to sell on Amazon. Identify simple-to-manufacture products that are already selling. Check the reviews to see what people don’t like about them (optional). Find a manufacturer to produce a similar or better product, usually via Alibaba. Create your own brand name and packaging. Make a bulk order, send in your inventory, and compete with the existing products on Amazon. The downside is private labeling is a capital-intensive business. You’re taking a lot of risk in purchasing (often) $1000 or more worth of inventory upfront. The landscape is competitive. That said, when you find a product that hits, it can be tough to keep it in stock. I’ve seen people grow some pretty serious e-commerce operations in a really short time with this business model. Where most would-be sellers get hung up is the very beginning: coming up with a product idea. Greg Mercer is a 7-figure Amazon seller and creator of the market-leading product research software Jungle Scout (use that referral link for an exclusive Side Hustle Nation discount). He joined me on The Side Hustle Show to share his top 3 private label product research strategies. You can listen to our full conversation here, or download The Side Hustle Show on your favorite podcast app. Dan Meadors and his partner Eric Lambert began selling on Amazon as a hobby using the retail arbitrage strategy mentioned above. They started with an original investment of only $600, and have since sold over $13 million worth of merchandise on Amazon! It took only a few months before they saw the potential to turn this hobby into a business and they both left their day jobs to sell on Amazon full-time. Dan saw wholesaling as an opportunity to scale up revenue faster. So instead of approaching a factory, ordering samples, and arranging your own packaging as you would with private labeling, wholesaling involves approaching the manufacturer and offering to help them sell their products. Based on what Dan told me, it sounds like wholesaling on Amazon may carry less risk than private labeling. Your upfront investment is likely lower, and you’ll probably end up spending less on marketing and product giveaways to seed reviews. You’ll need a resale certificate to get started with, issued by your state. Next, you can begin reaching out to brands you see that have a less-than-optimized presence on Amazon. The Merch by Amazon program is a cool way to make extra money without any physical inventory at all. How it works is you upload your designs and Amazon does the rest; they’ll print and ship the items to customers on your behalf. Even though “print-on-demand” services like this have been around since the late 1990s, none have ever had the reach or built-in customer base of Amazon. Currently, you can make t-shirts, long-sleeve t-shirts, sweatshirts, hoodies, and PopSockets, but I expect the inventory selection to continue to expand. I met with serial side hustler Elaine Heney of Ireland, who sold over $125,000 worth of shirts in her first full year as a part-time Merch seller. Of that, a little over $50k was profit. Evergreen Topics – Think of niches like professions, family roles, sports, hobbies, etc. Seasonal Topics – Think of creating designs or slogans around holidays like Valentine’s Day, Christmas, Halloween, Father’s Day, etc. You can create a Merch by Amazon account free here. Since chatting with Elaine, Bryn and I–and I’ll be honest, it’s mostly her–have made over $3000 very part-time from this program. We’ve played around with designs in all three of these categories. For evergreen topics, we made shirts targeting entrepreneurs, parents, and yoga lovers. For trending topics, one of our bestsellers was related to the 2017 eclipse. On the seasonal ones, designs for Mother’s Day and Halloween have done well. And I should clarify, I’m using the term “designs” pretty loosely. Almost all of our designs are 100% text-based. We build them in PowerPoint or with an app like Over or Wordswag. Don’t overthink it. It’s a fun, creative side hustle for sure. You can check out my full Merch by Amazon interview with Elaine here, or download The Side Hustle Show on your favorite podcast app. Did you know Amazon will pay you for used books, DVDs, Kindle devices, tablets, cell phones, and other products? This service is offered through an official “Trade-In” program, which pays you in Amazon gift credit for your merchandise. It’s not quite cash, but given how much and how frequently we buy from Amazon, it won’t be hard to use it! The cool part is they give you a free pre-paid USPS or UPS shipping label too, so all you have to do is package up the item and send it off. It’s easier than eBay, because you don’t have to take pictures, wait around for an auction to end, or deal with flaky buyers. Don’t expect to get rich from this program though. For example, my copy of The Office Season 1 was eligible for a whopping $0.25 in Amazon credit. Still, definitely worth looking into for sure if you have some old DVDs, video games, books, or electronics lying around collecting dust. If you’re in the mood to purge, check out what your items are worth to Amazon! After seeing the success of Etsy, Amazon of course had to get a piece of the pie in the “handcrafted” goods market. Their entry is called Amazon Handmade–and is open to sellers by application only. You can still set your own prices and control the branding and messaging on your sales pages. You can fulfill orders yourself, or take advantage of Amazon’s FBA program. Amazon takes a 15% cut from every sale, which is a bit higher than Etsy. But despite the popularity of Etsy, it still doesn’t have near the reach that Amazon does. If you’re already selling handmade goods offline or on Etsy in one of the categories above, it might make sense to apply to Amazon Handmade and see if you can earn any incremental sales. Amazon’s Kindle platform has empowered thousands and thousands of authors to take the plunge and self-publish their work to the world. Self-publishing is one of my favorite and longest-running side hustles. I published my first book in 2012 and have been adding to my author portfolio and earning royalty income ever since. Kindle authors make money on Amazon in a couple ways. The first is your author royalty when someone buys your book. For books priced between $2.99 and $9.99, you earn 70% of the purchase price. For books priced outside that range, you earn just 35%. Think of it as Amazon’s gentle way of telling you how much a book should cost! The second way Kindle authors make money is when readers borrow your book through the Kindle Unlimited program. This program, which rewards authors based on how many pages of content your readers consume, tends to work better for fiction authors–as readers will often devour several books in a month if they like your work. My experience has been entirely in non-fiction, but it’s still really rewarding any time someone buys your work. Over the years, this has earned me tens of thousands of dollars. The good news is, if you’re part of the 80% of the population who say they want to write a book, it’s never been easier to get it done. Once you’re ready, you can upload your work to Amazon through the KDP dashboard. While Kindle publishing can be a great source of semi-passive income, there’s a lot that goes into creating and marketing your book(s). I recommend checking out the self-publishing archives on Side Hustle Nation, or diving into Dave Chesson’s Kindlepreneur for in-depth strategies. In most cases, if you’re already creating a Kindle book, it probably makes sense to add a paperback version as well. Thankfully, Amazon has this covered with an in-house print-on-demand service called KDP Print. This is a way to make extra money on Amazon from your self-publishing efforts. Instead of a flat author royalty, print books earn a 60% royalty before deducting printing costs. For instance, The Progress Journal, my latest book, costs $9.99. That puts my initial royalty on every sale at $5.99. At 171 pages, it costs $2.90 to print each copy (printing costs vary based on length and interior color). Subtracting that printing cost, I make around $3.09 for every copy that sells. KDP Print books are handled through the same author dashboard as Kindle books, though you’ll need to create a separate book file and cover. In the first 12 months after releasing Buy Buttons, my biggest seller to-date, print sales accounted for over $4500 in royalties. Rounding out our ways to make money on Amazon from your own books is creating an audiobook edition of your work. Not every title is well-suited to this format, but it can be nice source of incremental royalties. Plus, some readers just prefer to consume content by listening to it, so by skipping the audio version, you’re missing out. I think it also makes your Amazon listing page for your book look more legit when you have all three formats available. To make it easy for authors to create audiobooks, Amazon created the Audiobook Creation Exchange, or ACX. There, you can find narrators to produce your book for you, or upload your files if you’re doing it yourself. For professional narrators, you can either pay a flat fee, or you can get the book produced for free in exchange for a share of future royalties. I think that’s a cool option to get your audiobook out there and share the profits when it sells. ACX royalties are a little complex. Self-published authors generally earn 20%-40% royalties through ACX, depending on the distribution options you select and the method by which your producer is compensated. As a podcaster, I felt like it was important to record Buy Buttons myself so listeners could hear my voice. It was way harder than expected! Still, that set my up to earn over $2300 in audiobook royalties in the first year. The other interesting way authors can make money from their audiobook is with the ACX referral bounty program. If your book is a new Audible customer’s first download, you’ll earn an additional $50-75, which can add up fast! As you might have guessed from the audiobook section above, there’s another way to make money from audiobooks on Amazon without writing anything yourself. That method is as an audiobook narrator and producer. If you love the idea of getting paid to talk, know your way around audio engineering equipment and software, and don’t mind reading other people’s work, it could be a fun side hustle. As the producer, you’ll be able to make fixed price bids on projects that authors post on ACX. You’ll also see royalty-share projects, where you’d be narrating the book for free upfront, in exchange for a share of the audiobook royalties and bounties when it sells. In both cases, you’ll submit your audition and get to work if chosen. A slow and steady income stream for me over the years has been Amazon Associates, Amazon’s affiliate marketing program. 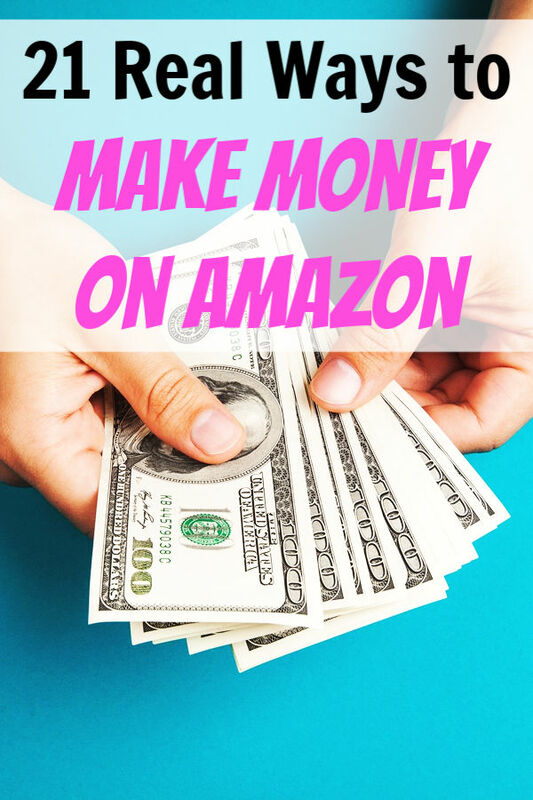 If you have a website or blog of your own, this is a way to get paid when you refer buyers to Amazon for products you talk about or feature on your site. Your commission will range from 4-15% depending on what you sell, but can add up to a significant amount. The best part of Amazon’s affiliate program isn’t the commission rate though; it’s actually kind of low compared to other affiliate programs. The best parts are the high conversion rate and how you’ll earn commission on everything someone eventually buys after they click your link. I’ve earned commission on some pretty random stuff over the years! Amazon Associates can turn into a semi-passive income stream for months or even years. For example, I wrote a post years ago on how much it costs to start a podcast. In that post, I showed which microphone I bought to start my show. Every month in my Amazon Associates report, I see a few more people who bought that mic. It’s probably earned a few hundred dollars in commissions at this point, which isn’t bad for the time it took to create one link in one article. If you have a blog or website already, you can request to join the Associates program here. And if you don’t have a blog, my free video course will help you start one quickly and affordably. Because of the low skill required, these tasks often pay next to nothing, usually starting at a few cents. Many of the workers are overseas where the costs of living are lower, but the platform is open to US workers as well. It honestly wouldn’t be my first choice of side hustles, but it is an option. One side hustler reported earning over $21,000 on Mechanical Turk in his spare time. He averaged around $0.25 a task, and said once your account history levels up a bit, slightly better paying HITs become available. Have you noticed that some of your Amazon deliveries are being dropped off by “random” people, instead of by the usual UPS drivers? I first found out about Amazon Flex when I saw a dude in a Jetta in our neighborhood pulling boxes out of his trunk and back seat. I asked him if he worked for Amazon or the post office, and he said he was a part-time Amazon Flex driver. This new program allows people to earn $18-25 an hour in their spare time, and helps Amazon deliver packages even faster. Flex is slowly being rolled out nationwide, and you can see what areas are available–or join the waitlist for your area–here. This side hustle appeals to people who have a reliable vehicle but may not qualify for Uber or Lyft–or just may not like the idea of driving strangers around. Like most modern companies, Amazon is beginning to embrace work-from-home jobs. When I checked the list of virtual Amazon job openings, I found options for full-time, part-time, and seasonal work. You can filter by job category, such as IT and Engineering, Customer Support, Sales and Advertising, Operations and Fulfillment, and more. There are both hourly and salaried positions available. Remember when Amazon was just an online bookstore? Of course now they sell everything including the kitchen sink, but did you know you can also use Amazon to connect with a plumber to fix that kitchen sink? According to the new Amazon Services, professionals like house cleaners, handypersons, electricians, landscapers, plumbers, and many more can apply to sell their services through Amazon. After you join, you’ll see every new job in your area and be able to choose the ones that fit your schedule. Per Amazon, “It’s a great way to keep your business busy or to fill in the open gaps throughout your week.” There are no startup or membership fees, but Amazon will take a percentage of each job booked, based on the service type and final service price. Entertaining video gamers are earning serious money broadcasting their games live on the Amazon-owned Twitch.tv. Twitch streamers make money with a share of the site’s subscription fees, advertising on their channels, donations, and selling merchandise to their fans. The most popular players are estimated to be bringing in $300,000 or more per year! When a friend turned me on to RebateKey, I was pretty skeptical it was a scam. The site promised to refund your purchase–most of which are on Amazon–a month after you buy the product. The way it was explained to me is as a service for new Amazon sellers to get some sales history to their listings, and hopefully some reviews as well. That means for buyers, you can find deeply discounted–and even free-after-rebate–items. The first thing I bought were some turmeric capsules for around $20. I figured I was going to buy them anyway, and it would be a good test to see if the rebate check actually came. And sure enough, after about a month, I got paid back in full for my purchase. Pretty crazy, but true. So it’s not necessarily a way to make money on Amazon, but it sure is an interesting way to save money. RebateKey is definitely a site worth keeping in mind for upcoming purchases to check and see if they have what you’re looking for. The first is with the Capital One Venture Card. The card earns 2x points on every dollar I spend, which I then turn around and cash in for Amazon gift cards. When I do that, I’m earning essentially 1.6% cash back on my spending–vs. 1% if I redeemed the points for statement credit. Drop is a cool free app that adds an extra “boost” to the Capital One card above (or whatever credit card you use). How Drop works is you pick the 5 stores you frequent the most–places like Target, Safeway, Starbucks, and Trader Joe’s–and you’ll earn an extra 1%-ish cash back on whatever you buy there. Just download the app, link your credit or debit card, and you’ll earn extra rewards points for the purchases you make every day. It’s super passive — once you’re set up you’ll earn rewards automatically, which you can then cash in for Amazon gift cards. It took a few months to earn my first free $10 Amazon gift card, and I’ve earned a couple more since then! These are the great source of making money online through Amazon. I’ve made around $200 dollars last year by promoting tech products, and this guide gonna help me to make even more than that this year! And your post cleared so many doubts. If you know how to build apps, then you can get paid for every minute your app is used with Amazon Underground. Plus you can build Alexa skills as well. Nice! Thanks for sharing Oskars! I had no idea there were so many ways to make money with Amazon. What a great list! I have to thank you for this pretty exhaustive list! Oh and PS – your site is amazing, and inspirational! Thanks for all you do for those of us wanting to work for ourselves.